The growing movement for the federal government to take the lead in effecting policies that will negate the effects of both economic inequality and climate change has been incorporated into what is being referred to as the Green New Deal. Our U.S. Sen. Edward J. Markey, is among those who is spearheading the legislation, along with newly elected Congresswoman Alexandria Ocasio-Cortez of New York. The key features of the Green New Deal are both economic and environmental. Health insurance for all Americans, job creation, and the expansion of the safety net are among the highlights of the economic aspect of the proposal. On the environmental front, the goal is for the United States to become carbon-neutral within 10 years. Both aspects of the proposal will face opposition in Congress from Republicans. The economic aspects will require raising taxes on the wealthy, which essentially would repeal the tax cuts approved by the GOP Congress last year. The environmental goals will face a fierce fight from the energy industry and other business groups. First, that we are becoming a plutocracy — a government of the rich, for the rich, and by the rich. Second, that climate change will wreak environmental and economic havoc on our nation with catastrophic consequences unless we take immediate steps to reverse its effects before they reach a tipping point from which we cannot escape. Some may call the Green New Deal a pie-in-the-sky idea. But the reality is that unless we do something — and soon — about the growing concentration of wealth in the hands of a few and the imminent threat of climate change, the future of America (and the world) is grim. Say what you will about the state of politics in our country these days, one thing that is undeniable is that Americans have become more engaged in the political process than at any time in our recent history. The recent election of scores of women, of diverse backgrounds, to public office has signified that men no longer will be running the show. This is a good thing, not only for women, but also for men — and by extension, for our entire nation and the world — because when those who control our democratic institutions reflect the make-up of those whom they are serving, the end result will be policies that benefit all Americans, in all our diversity, rather than just the few. It took the current political environment to wake us up from our complacency . We look forward to our new Congress and trust that the talented and energetic women who will be serving as our senators and representatives will bring a positive attitude and some meaningful changes to the status quo. There are three questions on the ballot for the upcoming state election on Tuesday, November 6. The three are about as unrelated and disparate as one could imagine. The first question asks voters to adopt a proposed new law that would require minimum staffing by nurses in every hospital in the state. We have to admit that when we started reading the full text of the very lengthy proposed new law, our eyes began to glaze over because of the use of terminology that may be common to doctors and nurses, but which means little to the rest of us. However, what is clear is that those who proposed this question have a good idea of what they’re doing. We doubt there is anyone who would dispute that nursing care in hospitals is critical for patients. It also is beyond dispute that avoidable mistakes in hospital care are a leading cause of death of patients in even the best hospitals. In our view, this ballot question comes down to a cost/benefit analysis: Is the added cost of minimum staffing for nurses (and by the way, no one really knows what that dollar figure might be) worth the undisputed benefits for patient care? Question 2 seeks to amend the U.S. Constitution to limit the spending by corporate entities. The amendment is designed to overturn the Citizens United decision of the U.S. Supreme Court, which declared unconstitutional the limits imposed by Congress on campaign spending by corporations. The only way to change Citizens United is to amend the Constitution — a drastic measure, no doubt . Question 3 seeks approval of an already-existing state law, that was approved by the legislature in 2016, that bans discrimination against transgender persons. The law has been working well and is endorsed by many groups and organizations, including the Mass. Police Chiefs Association. A “Yes” vote keeps in place the current law. Boston City Councillor Ayanna Pressley enjoyed tremendous support in Chelsea from a wide array of residents and City officials in the Seventh Congressional District race. campaign watch party shortly after it was announced that Pressley won. Pressley recorded one of the biggest upsets in Massachusetts political history when she defeated Congressman Mike Capuano in the Democratic Primary on Sept. 3, and nowhere did she find a warmer welcome than from supports in Chelsea. Here supporters here, in fact, were some of the earliest to join her campaign this year. One of Pressley’s most visible supporters in Chelsea throughout the campaign was Saritin Rizzuto, a well-known community organizer. Rizzuto organized the largest local fundraiser of the campaign when more than 180 supporters came to the Tu Casa Restaurant on Broadway for a meet-and-greet with the candidate. Pressley, who was introduced by Rizzuto at the event, did not disappoint her supporters, delivering a rousing, inspirational address that had the crowd on its feet cheering. Rizzuto and Pressley have been friends for 15 years. They have worked together on various issues through the years. Rizzuto served as a board member at Casa Myrna and Pressley was very supportive of the organization that seeks solutions to end domestic and dating violence. Council President Damali Vidot was one of the first elected officials to endorse Pressley many months ago, and campaigned vigorously for her in Chelsea and beyond. Marisol Santiago was also a major force for Pressley in Chelsea, having worked on many campaigns in the past. She said Pressley gave everyone a choice, and also caused her to think about her community. Rizzuto said Pressley’s experience as a councillor-at-large in Boston, coupled with the personal challenges she has confronted in her life, set a strong foundation for her run for the congressional seat. “Ayanna can relate to the situation of people who have struggled, who have been homeless, who have victims of sexual assault,” said Rizzuto. Pressley’s speech that night rallied the troops and kept the campaign momentum going in Chelsea. With the Democratic primary coming up on Sept. 4, Congressman Mike Capuano and Boston City Councilor Ayanna Pressley discussed the issues of transportation and housing, among others, in the Massachusetts’ 7th Congressional District Debate held at UMass Boston on Tuesday, August 7. From the start, the two sides agreed on their stance against the current administration, although the stance wasn’t simply to be anti-Trump. Capuano pointed to several issues, including healthcare and women’s rights. Challenger Pressley stressed that she wasn’t dismissing the efforts of the incumbent Capuano, who is serving his 10th term in Congress, and his experience, but she emphasized the district’s need for activist leadership. Capuano, who cited how the district has seen its public transportation grow during his tenure, said his experience matters. Fighting for a majority minority district, Pressley also noted her frustration against the charges of identity politics being lobbied against her. The first woman of color elected to the City Council, Pressley recognized the importance of race and gender but said it can’t be recognized for the wrong reasons. The debate was hosted by WBUR, the Boston Globe and UMass Boston’s McCormack Graduate School of Policy and Global Studies. It was moderated by WBUR’s Meghna Chakrabarti and the Boston Globe’s Adrian Walker. The Democratic primary will be held on Sept. 4, while the general election is on Nov. 6. However, the race between Capuano and Pressley will be decided in the Sept. 4 primary. The 7th district encompasses parts of Boston, Cambridge and Milton, and all of Everett, Chelsea, Randolph and Somerville. When the chips were down a few years ago and few were willing to stand up, rock the boat and call on President Barack Obama to slow down deportations from the country and places like Chelsea – Illinois Congressman Luis Gutiérrez told a crowd of people at Pan Y Café in Cary Square last Friday that one man stood with him. That man was Congressman Michael Capuano, and the popular Latino congressman from Illinois appeared with Capuano Friday morning, July 20, in Chelsea to endorse Capuano and remind voters here how hard Capuano has been working – both in good times and bad times. Gutierrez has become a very popular member of Congress in the last few years as immigration issues have come to the forefront and he has combined with others like Capuano to tell the stories of those caught up in the system. Capuano took him on a tour of two locations in Chelsea Friday and one in Boston – talking to Latino and immigrant groups throughout the City. It reinforced that battle ground nature that Chelsea has taken on within the congressional race between himself and challenger Ayanna Pressley. On Friday, he also received the endorsement of Councillor Leo Robinson and Roy Avellaneda. State Rep. Dan Ryan, who previously endorsed him, was also in attendance – as were several local movers and shakers. Robinson reminded everyone that Capuano has always brought home important monies for Chelsea from the federal government, including money recently allocated for rebuilding Quigley Hospital at the Soldiers’ Home. Capuano was gracious, and said he really appreciated the support from Chelsea and Gutierrez, his colleague in Washington, D.C.
Six Chelsea city officials endorsed Boston City Councillor Ayanna Pressley’s candidacy for U.S. Congress at a campaign event last Thursday night at the Mystic Brewery. City Councillors Damali Vidot, Jamir Rodriguez, and Enio Lopez and School Committee members Lucia Henriquez, Kelly Garcia, and Julio Hernandez each praised Pressley in separate speeches stating their endorsement. Vidot, who has been a force in Chelsea politics since being elected as a councillor-at-large in her first run for citywide office, said she embraced Pressley’s candidacy from the beginning. The endorsement event followed a second campaign reception earlier that drew a large crowd at Tu Casa Restaurant on Broadway. 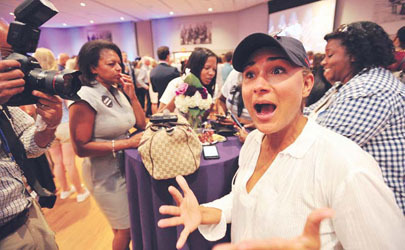 Saritin Rizzuto organized the gathering and was pleased with the sizable turnout of supporters. “My friend, your advocate, and our candidate for the Seventh District congressional seat ,” said Rizzuto in an enthusiastic introduction of Pressley. Pressley thanked her many supporters at Tu Casa. Pressley is challenging incumbent Michael Capuano in the Sept. 4 Democratic primary in the Seventh Congressional District. The Chelsea Black Community (CBC), under the leadership of President Joan Cromwell, hosted a Candidates Forum on June 27 at the Chelsea Senior Center. Four of the five candidates for the Suffolk County District Attorney’s position in the Sept. 4 Democratic Primary– Linda Champion, Rachael Rollins, Shannon McAuliffe, and Evandro Carvalho – participated in the forum. Cromwell announced that DA candidate Greg Henning was invited to the forum, but was unable to attend due to another commitment. Boston City Councilor-at-Large Ayanna Pressley, candidate for U.S. Congress, took part in the CBC’s Congressional Candidates Forum. Congressman Michael Capuano was unable to attend because Congress was in session in Washington, D.C. The four DA candidates presented their qualifications for the position and stated how they would run the DA’s office if they were elected. There were some spirited remarks by the candidates while discussing issues such as immigration, sanctuary cities, criminal justice reform, the homeless, diversion programs, the opioid crisis, and the safety of residents in Suffolk County. Rollins delivered the most eye-opening comments of the forum when she spoke about the lack of diversity in positions of leadership at ROCA, the Chelsea-based agency led by CEO Molly Baldwin. Rollins’ comments came after McAuliffe, a former director at Roca, had rebutted Rollins’ earlier statement that she [Rollins] had management experience at Massport, MassDOT, and the MBTA, which, Rollins noted, are much larger organizations than ROCA. Pressley, who received the most enthusiastic ovation of the night upon her introduction, said, “I am running for Seventh Congressional District because this is the most diverse district, and yet it is the most unequal. And if you need any evidence of that, you get on the No. 111 bus and just try to get to work on time, or you can get on the No. 1 bus in Harvard Square in Cambridge and ride it all the way to Dudley Square in Roxbury. And what you will see visually is a stark contrast of life experiences, median household income, and life expectancy drop by decades. Councillor-at-Large Leo Robinson, who represented Capuano at the forum, delivered a speech highlighting Capuano’s many accomplishments in office as Chelsea’s congressman. Sharon Caulfield, associate dean of Bunker Hill Community College, did a masterful job as the moderator of the forum. Caulfield, whose husband, Michael, and daughter, Emily, looked on proudly in the audience, kept the program moving smoothly, was professional and courteous in her manner, and was impartial in her actions. Joan Cromwell thanked Chelsea Community Cable Television and its executive director, Duke Bradley, for televising the forum and the Chelsea Record for its publicizing and coverage of the forum. And all who participated in and attended the forum, agreed.